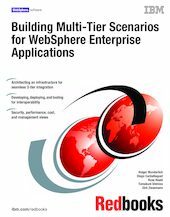 This IBM Redbooks publication will help you build multi-tier scenarios for WebSphere Enterprise Applications. It applies to WebSphere Application Server V4.01 for z/OS and OS/390. We cover the aspects of architectural, organizational, and technical issues that you need to consider when selecting an application and runtime design. This book can be used in conjunction with Patterns for e-business when you are faced with making decisions about application patterns and are looking for supporting information. Because our analysis is done from the perspective of the z/OS platform, we discuss strategies for offloading Web applications from z/OS or from WebSphere for z/OS. We provide ano overview of different scenarios and give guidance on platforms, security, deployment, performance, scaling, and EIS integration. Using this book will enable you to architect an infrastructure for seamless three-tier integration by helping you to develop, deploy, and tool the application for interoperability, as well as install and configure the different infrastructures.